MacDailyNews Take: There’s no substitute for owning and controlling the primary technology. Kind of interesting that Apple- a company founded by the biological son of a Syrian- would locate a critical technology office in Israel. Why? He left, went to school abroad, then came to the US to finish his education and stayed. He was a non-practicing Muslim and not a nationalist. Like most of the population. They purchased a critical chip maker from Israel, this is likely that same office/company. Jews while small in number (under 15mil worldwide) make up a large portion of all Nobel Prizes (about 25%). It is not at all surprising that there would be a critical component for technology originating out of Israel which has just under half the total number of Jews worldwide. Fake facts, Israeli Jews have a lower average IQ than Jews in Europe and America where the majority are Ashkenazis, while only 40% are in Israel. The majority of Jewish Nobels haven’t been out of Israel. By your logic they should move their chip maker to New York. You seem fixated on Jews. It’s the only time you’ve ever heard me mention it. It was also in direct context. Do you have a sensitivity perhaps? 100% of Nobel Prizes in the sciences have been won by people! I think it demonstrates that people often get along, cooperate, and do constructive things together. Even people who are supposedly “enemies”. So I agree: its is interesting. But it is not surprising. So, this confirms that Apple Inc. are actually developing the “Puck” for release in 2020, because they are fed up with being the only ones “skating to where the Puck is going, not where it has been”. Maybe, other clueless vendors will then have a “Puck” beacon that they can head towards, Haha!! I’m sure Qualcomm is already working on newer and faster processor designs for the entirety of Android. Qualcomm absolutely has to stay with Apple in terms of chip design because so many companies depend upon Qualcomm. If Apple goes 7nm then so does Qualcomm. Same with 5nm. At this point, I’m sure it just a matter of stuffing more transistors in a SoC package. The main difference of the A-series is that the package is huge compared to Qualcomm’s SoC. Actually, I’m surprised Qualcomm can meet all the qualifications for so many different devices and not get left in the dust in terms of performance. However, Qualcomm still remains a very valuable company. With a P/E of nearly 40, it’s valued much higher than Apple. Srouji is the next COO after Federighi. One interesting snippet from the full article is that Apple designs the silicon at least three years ahead of time and optimises that design to suit whatever technology Apple expects to be using at that point in the future. When analysts were recently circulating rumours about how Apple was having to make last minute hardware changes to iPhone X, those of us who follow Apple knew that the rumour couldn’t possibly be true as Apple needs to lock down the design about a year before it’s released. We now know that Apple has a pretty good idea what sorts of things it will be expecting iPhones to be doing in three years time, the design of the iPhone in two years must be largely complete, while next years iPhone design will already be finalised and locked down. Apple certain’y do play the long game. The lead times before finished products start shipping is long, but no where near as long as you state. For example, the 2018 iPhone “A12” chip is most certainly not “locked down” at this point in time. It’s feature set very likely is, but the hardware design most certainly is not. 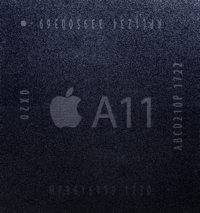 The “A12” chip for the 2018 iPhones certainly taped out weeks ago. It certainly is in test production now or at the very least before the end of this calendar year. Tweaks to the tape out can easily happen between creation of test chips and production test runs. Production samples (test runs) likely will happen in the first calendar quarter of 2018. While it is less likely, tweaks to the tape out can happen between the production test runs and the production runs. Production runs will likely start in the second calendar quarter of 2018. This will give Apple a couple months before it has Foxconn and others start assembling the 2018 iPhones. While the core feature sets of the new iPhones that will start shipping in 2018 are almost certainly set, there’s still room for some tweaks. The hardware design is headed toward being set, but any sane person can’t believe that the fall 2018 iPhones’ designs are 100% cast in stone at this point in time. This has been going on for many, many years. You only have to think back to the late 80s with Apple’s core OS team and the “blue/pink/red” meetings. The team was laying out the plans for Mac System Software (as it was called back then) for the next decade. They wrote near term features on blue 3×5 cards (many of which showed up on System 7), medium term, but much more ambitious features on pink cards (that version of Mac system software kept the “pink” name for a few years), and far out, wish list type features were written on red cards. Apple had a limited version of Pink running as far back as 1990. If Apple had completed it and shipped it by 1994 the dark days might never have happened. Instead the most senior leadership lost their way and became enamored with nifty new toys that were not ready for prime time and shipping several dozen variations of everything trying to be all things to everyone. Can anyone here on this site say what the difference was between the Performa 6400 and Performa 6410? The bottom line is that Apple has always planned way ahead. It lost it back in the early 90s, but got back to it during the clime out from the dark days. But, an important but, things are not locked in until Apple has to do so.